When I was about ten, I used to haunt neighborhood garage sales for paperbacks, which I would purchase for a dime or a quarter. 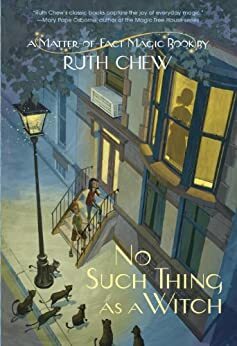 On very lucky days, I'd find something by Ruth Chew. Her books, about underattended children and witchcraft, were a fine use for a summer's day. And a few years ago, when my first son was old enough, I bought a bunch of these out of print titles to read aloud to him. Luckily, a Random House editor somewhere had the same c. 1980 garage sale habits as I did. The books will be reissued later this month, as $5.99 in paperback or as ebooks. What the Witch Left and No Such Thing as a Witch are the first two titles to release. The covers are new and tastefully modernized. Why does this make me happy? These books are entertaining in a quiet way. There's plenty of action and mystery, but they are never violent, and never rely on fart jokes to win children's attention. Pure storytelling still counts. I hope they sell like proverbial hotcakes.